Running throughout the year. Everything is organised from our centre, an old fishermen’s house at the foot of the harbour. In a 500m2 space, we have changing rooms, showers, rinsing area, wet area, rental of new equipment, etc..
To provide the courses, we have a classroom equipped with everything necessary, in addition to a rest area with WI-FI zone. In our shop you can find all kind of Cressi-sub recreational diving equipment and technical diving equipment of the main brands. Of course, the safety measures are continuously reviewed and prepared for any eventuality: complete oxygenation and first aid kit in each boat and in the diving centre, contract with hyperbaric chamber thirty minutes from the centre, communication between all boats and an evacuation plan. 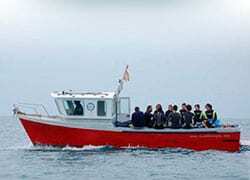 And what you come here for, to dive, we have boats with a capacity for 44 divers, continuously working. Capacity for 11 divers with equipment and a skipper. Yamaha 4T engine – 200 hp.